Around Sugarhouse. 10.5 miles in 1:17. No running. Sick, sick, sick! Took a sick day for the first time in seven years. Looks like I picked the wrong week to get serious about running. AM:Two mile walk around Sandy. Just for my mental health. It's supposed to be 65 degrees here today which will break the old record high by 9 degrees!!!! 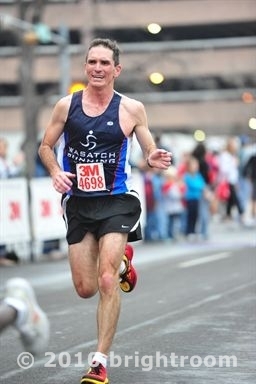 I received an email from marathonphoto saying "Dear Mr. Murphy, we noticed that you have not purchased any of your recent event photos". Then they wanted feedback about how they could "serve me better". I told them they could start taking pictures of me that made me look younger and faster. PM: 5 miles on the treadmill plus some lifting. 10 miles on the treadmill. Averaged 8.5 mph. Sauna and hot tub after so I feel pleasantly tired now. AM: Swim meet Saturday! 8.5 miles on the treadmill at the Provo Rec. Center which is a great facility far surpassing anything we have in Salt Lake. Their tax dollars at work, ours not. PM: Easy 4.5 miles around Liberty Park. Didn't drop under 8 minute pace until the last mile. AM: Three mile walk/jog around the neighborhood. Cool, clear, beautiful. Saving my run for later but I just had to get outside. PM: Ran a super easy 2 miles and then stopped for a few minutes of stretching. Then I ran 9 miles around Sugar House Park @ 7:20 pace, dodging the springtime crowds the whole way. Lots of tulips coming up around our neighborhood. I'm betting that's never happened in early February. AM: 2 mile suburban hike in Sandy, Utah. PM: Easy 4 miles plus lots of weights in the nifty new Alta High Fitness Center. Treadmills and stair masters coming next week! Noon Time: Another 2 mile constitutional. Beautiful out. I'll have to wait until after Andy's parent-teacher conference at 5:45 to squeeze in a run. My #1 frustration in life is that I can't do morning runs when the sun is up. It's my favorite thing and my job won't let me do it. Better than not having a job though. I guess. PM: 10 miles @7:45 pace circling the neighborhood. Felt pretty good actually which is rare for a run at 6 pm. AM: Another 2 mile walk. I'm a walker. PM: 8.25 miles in the gully with my team. Ran without a shirt the last three miles. Apparently some quasi-winter weather is coming next week. Easy four. Think I'll race tomorrow. Woke up at 4 am. Tossed and turned for another 2 hours. Woke up for good at 6. Had a cup of coffee. Argued with girl child about watching the news or one of those nauseating teen shows on the Disney Channel. I have the only 14 year-old in the U.S. that gets up at 5:30 on Saturday. Ate a bowl of Grape Nuts with raspberries. Had another cup of coffee. Took a shower. Walked dog. Dressed for race. Jogged a mile around the neighborhood. I always shower before races. Started doing that in high school. Some people think that's wierd. Hopped into the car, struck out across the West Desert towards the basin that used to hold the Great Salt Lake (it's disappearing). Listened to Social Distortion's "Live at the Roxy" album at high volume. Got to Saltair and parked next to Fritz. Went into the building and registered. Made small talk with lots of runners. Joined the SLTC for what seems like the 10th time in my life. Jogged a couple miles to warm-up. Hit the latrine for a while. Good, quality time there until I noticed no toilet paper in stall. Fortunately I had some in my jacket pocket because I ran my first road 10k in 1978 and I'm a veteran. Headed to the starting line. Saw Dennis S. there. Crap! Saw Blake too which cheered me up. Gun went off and I motored east with a couple hundred runners. Soon found myself alone in no-mans land running all by myself. Fell about a hundred yards behind Bill C. and Dennis and stayed there the entire race. Hit the 5k turn-around in the low 18:30s which was the same time I ran the 5k in 2 weeks ago. Caught Blake there and tried to encourage him. Headed back into a slight headwind. Caught one youngster and passed him at 5 and a quarter but he kicked past me the last .2. I don't really kick anymore. Just an observation. Need to work on that. 37:11. 15th place. 3rd in 50-54. Sheesh! My time is an age-graded 32:31. Chop off another 60 seconds for the altitude and I ran a 31:30 10k today if I was 25 and at sea-level. Jogged a couple milles with Bill after and then grabbed a cup of coffee and some free bananas. Bummed that they didn't have any more Great Harvest coupons. Drove home with Mike Ness and Chuck Biscuits on the drums. I'm hoping to average under 6 for the 15k in 2 weeks if the weather cooperates. Then I'll know I can run a 1:15 screaming downhill half-marathon this spring. PM: One easy mile just to make it to 50. Easy two miles so not a great running day. Had to feed the youth sunday school classes breakfast then I HAD to take Andy to see the Sponge Bob Movie. Plus I'm kind of sore from yesterday and I want a good run on my day off tomorrow. Eight miles around the wood-chip at Liberty Park. Swung by the gym on the way home and did some pretty hard lifting/strength training. I wanted to run long today but I just wasn't feeling it. Just wanted to get home and hang out with the family. Would have been nice to have had someone to run with today. I messed up my back lifting yesterday and it just got worse during the night. We'll see how it goes. I surprised myself with a good run tonight. I'm really sore and achy from my lifting yesterday and maybe a little residual from Saturday's race. Just generally sore, achy, and beat up feeling. But Ann and the kids went to an activity at church tonight which I opted out of - giving me time to run. Ended up with a nice 10 miler feeling better each mile. Didn't ever dip below 7:45 pace, so a nice recovery run. Perfect crisp, clear evening with a beautiful sunset. Wished I could have just kept running west. Spent some time tonight looking at the blogs of lots of the people who used to post here daily and don't anymore. I know some of them still run, but for some others it seems like running was just filling a temporary void in their life. They were really into it and flamed out. Need to keep an even keel. Anyway, I miss lots of them. Easy five and then a long walk with Ann. Sunny, clear, and a little bit cool. Great start to my day! As I was walking through the parking lot into my classrom, I was bombed with about a pound of pidgeon poop. "Showered" in the bathroom sink and changed into a race t-shirt from my running bag. AM: 2 mile walk/jog around Sandy. Seriously, I ran about half of it so I'm giving myself a mile. PM: Nice afternoon. Ran a mile on the treadmill at the Sandy gym waiting for my runners to get to the gully. Then I ran 8.25 in the gully - first half with the boys then I doubled back to run with the girls. They managed sub 8 minute pace coming down. I was happy with their effort. Then I went to the new Fort Union Trader Joe's to pick up some milk, cereal, flowers, and chocolate. And let me just say that Utah Trader Joe's should be called "Sort-of Trader Joe's" because of the absence of Two Buck Chuck. It just isn't the same. Then I picked up Abby at swim practice, went home and has a dinner of Sloppy Joe's and broccoli. McFarland USA opens tomorrow. Anyone want to go see it with me? I've got to see a movie on cross country running just out of principle. 10.5 miles on the treadmill. Some hard running. I'm down to 147 pounds. A night of Cub Scout fun on tap with Andy! Easy am run around Sugar House. Long run tomorrow - hopefully. Going to see McFarland USA at 12:45 with Abby and Andy if anyone wants to join us. Went to McFarland USA with Abby and Andy. Really good life in general movie, mediocre running movie. Fat runner and runners with linebacker type builds winning state championships. Are there no skinny actors out there? None of the cross country meets in the movie had the feel or atmosphere of real cross country. Also, with the exception of the McFarland coach, all the coaches in the movie were jerks and racists. As we all know, cross country coaches are the salt of the earth, the best of God's creation. The movie was about a lot more than cross country though and those parts were excellent. Thouroughly enjoyed it as did the kids. #6 and #9 were actually 1.25 miles at 5:56 and 5:52 pace. Finished with a quarter mile at 5:27 pace. Warm-up and cool-down to get to 20 miles. Dinner tonight at Rusted Sun Pizzeria on State St. Salt Lake's best in my opinion. Great after a 20 miler! PM: Easy 3.25 miles warming up at track practice. 9.25 easyish miles at track practice. Busy day, Ann and I are both working, kids at school, parent-teacher conferences tonight until 8. I'll try to get an easy run in at practice. Seven rainy, snowy, miles at track practice plus a few speedy striders. 6.5 miles on the Porter Rockwell Trail from Draper Park. Looks like I'll hit 60 for the week and 200 for the month. Big miles! AM: One easy mile just loosening up for the 15k today. The 10 am start time is the best thing about the SLTC Winter Series races. Weather looks perfect for the race but then with several days of winter weather moving in. Maybe 2 ft. of snow in the mountains! Not sure what to think of this one but I'm trying to find the positive. Went in with some pretty high expectations of being able to hold a sub 6 pace the whole way. This I managed for 3 miles before reeling off six straight miles in the 6:15 range. My legs just didn't have the pop I expected. Maybe the 20 miler I did six days ago was too close? Maybe I'm just rushing things in my mind a little too fast? On the positive side, at about mile three I thought I might completely blow up and end up jogging it in at 7 to 8 minute pace but I managed to keep it together. It was helped by the fact that I was running just a little behind Bill Cobler (who's really running well) and a little bit ahead of Dennis Simonaitis (whom I've NEVER beat). So I was in the thick of the GRAND MASTERS competition! I found myself hoping Bill would roll an ankle or something. Never did catch Bill but I managed to stay ahead of Dennis which was good for my self esteem. On the down side, it was my slowest ever SLTC 15K by quite a bit and over a minute slower than last years time. But I'm feeling pretty healthy and strong and I'm confident that I can close the gap between me and my younger self. I started my cool down jog with Fritz and crew but their pace was a little (lot!) too fast for me so I turned around after a mile. Fortunately I bumped into Dennis and Michelle doing their cool down at about 10 minute pace. More my speed! So I joined them for a couple more miles and had a great conversation. They're just a couple of smart, thoughtful people and I really enjoyed getting Dennis's perspective on some things running related, AGING related, and life related. The bottom line is that Dennis has had much more success as a masters runner that I have, or anyone else in America for that matter, and he still isn't afraid or too proud to come out and race even when his training isn't going well. I learned something from that. Update... A little over 3 hours after finishing, I'm still pretty wiped out. PM: 3 mile walk with Andy. Stopped at a Maverick for an ice cream sandwich even though it was 30 degrees and snowing.